Ted Long was born on February 5, 1932 in North Platte, Nebraska. He attended North Platte High School and received numerous art internships, but has had no formal art training. Most of his work covers 1800 Western U.S. culture; his paintings and sculptures of the American West are extremely detailed and heavily researched. Long still resides in North Platte in a historic, century old log cabin but his work is known in New Mexico, Germany, Arizona, Wyoming, and Minnesota. Some collectors of his work include John Wayne, George Montgomery, Henry Fonda, Ken Curtis, Amanda Blake, and Ben Johnson. In the heart of America lives Ted Long. Ted is dedicated entirely to the fascinating legacy of the old west, so much that his North Platte, Nebraska, studio is situated in a century-old log cabin on a ranch his great-grandfather homestead in the 1800s. Within sight of his home is the historic plains where the Sioux, Cheyenne and Pawnee Indian tribes followed great herds of buffalo, and where cattle stampedes, battles between calvary and Indians, and the continuous migration of settlers west was commonplace. Inspired by the rustic and beautiful surroundings of his homeland, Long’s works have an exciting touch of stark realism that puts his artistry in a class by itself. Western hospitality was the order of the day when President Ronald Reagan had lunch at the Long Ranch in 1987. Long presented the President with The Last Farewell, a bronze of Buffalo Bill Cody. In 1978 Long was commissioned by the Nebraska State Historical Society to do a life-sized bronze bust of Ponca Chief Standing Bear. In 1979, he received the Old West Trails Foundation Art Award. 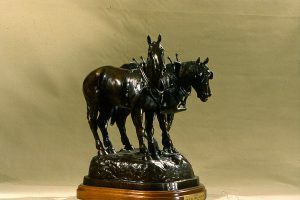 In June of 1991, Long’s bronze, When Nature Kept the Balance, was placed in the permanent collection of the Buffalo Bill Historical Center in Cody, Wyoming. Ted works in oil and sculpture. His love and involvement with the outdoors is felt in each of his paintings and bronzes. He has immersed himself in the stories of the west, from Buffalo Bill Cody to Chief Standing Bear. And he, like the chroniclers of those early days, has quite a story to tell.